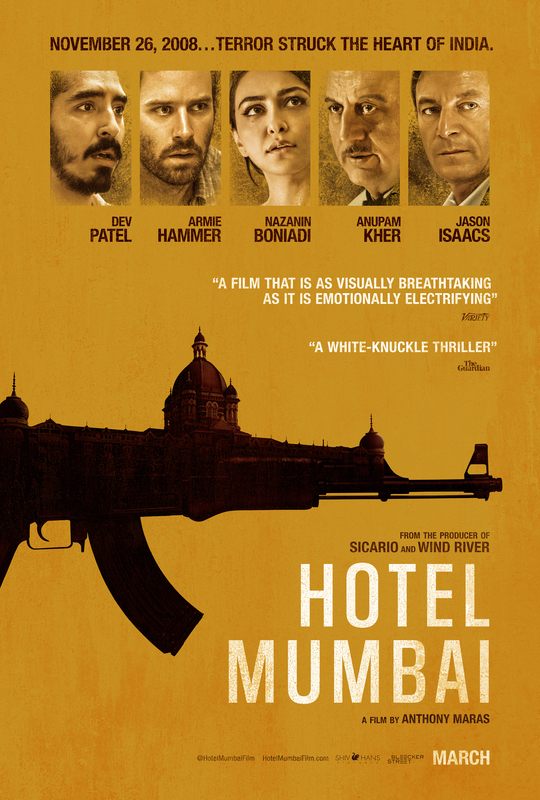 The story of the true life attack on the famous Taj Hotel in Mumbai, India from 2008, Hotel Mumbai spares no level of violence or terror in its attempt to show the story of the evil being wrought by the terrorists and the heroism of the staff of the hotel among others. The day is like many others for hotel worker Arjen (Dev Patel), except he is running late for work. Delivering his child into his pregnant wife’s arms took long than expected, and so he was in a rush. So much so that he does not realize that he had dropped his work shoes, a problem that nearly got him sent home from work by head chef Oberoi (Anupam Kher). Arjen talked his way out of being sent home. Little did he know what was about to happen. American David (Armie Hammer) and his Muslim wife Zahra (Nazanin Boniadi) arrive with their newborn baby and the nanny Sally (Tilda Cobhan-Hervey) for a visit at the Raj Hotel. None of the guests or the staff knew that a small group of radical Muslim terrorists were preparing to strike across multiple targets around Mumbai, including the Taj. This was very difficult to watch, because it was so realistic and so violent. The brutality these men committed with little to no empathy was wrecking. Without any previous knowledge of the event, I was grabbing onto certain characters that I wanted to survive the siege and the connection was tense. I was on the edge of my seat the entire time with stress over what was happening. Dev Patel was amazing. I was not a huge fan of his in the film Lion, though everyone else seemed to love him there. However, this was just unbelievable. The heroism that this man showed int he face of such horrendous odds was inspiring. My favorite scene of all of the film was when he approached a woman in the survivors who had expressed concerns over Arjen’s beard and head covering. Instead of approaching the ignorance of the woman with anger and frustration, he came over to her, showed her pictures of his family and spoke kindly and straightforward to her. After which he still offered to remove the head covering and beard if it would make her more comfortable. She told him he did not have to and that she was just afraid. This really showed how ignorance can be overcome with kindness and honesty. It was a quiet scene in a very bombastic movie but it stood out more than any of the violence. Armie Hammer was also great in this film. We kept waiting for the tall, blonde American to step up and become that action hero that we are used to in the movies, and when that did not happen, I was not sure how to feel. The tragic nature of the film really hit hard when Armie’s fate was revealed. In fact, I kept looking for the big action hero to step up and do something and when it did not come, it challenged my idea of what the film would be. Perhaps the terrorists were a bit underdeveloped here though the film did try to provide us with some motivation for them. In particular, Imran (Amandeep Singh) was shown with a tad more depth than his co-terrorists. I will admit, though, the attempt to humanize Imran and show why he was involved and to show how deep his religious beliefs were held did not work to keep me from wanting that guy to pay for his involvement. I found his fate to be very satisfying. There was such an intensity with this film that I was physically uncomfortable watching it and I desperately hoped for a positive result. Though it may not have been a completely happy ending, Hotel Mumbai was a devastating film to watch.